Omega-3 fatty acids are vital for a healthy body. They are present in seeds, nuts, fish and seafood but for many it is difficult to obtain the recommended amount from diet alone, so many people choose to take supplements. There are many choices available, including Omax 3 Ultra Pure. 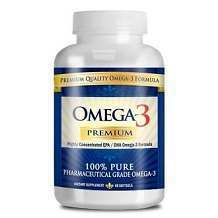 It claims to deliver 93.9% pure Omega-3 which helps enhance cognition, improve heart health and reduce inflammation. Our review of Omax3 Ultra Pure will help you make an informed purchasing decision. These are standard ingredients for many Omega-3 supplements except that Omax says it uses a proprietary 4:1 EPA to DHA formula. There appears to be no artificial flavorings, colorants or fillers. Prevention Pharmaceuticals recommends taking two softgels daily, with a meal. The total level of Omega 3s is good. However the proportions of EPA and DHA may not be ideal for maximum benefit. Studies have recommended a combination of 800mg of EPA and 600mg of DHA. The larger concentration of EPA is unlikely to be dangerous, but the reduced amount of DHA may lessen the efficacy of the product. The manufacturer lists no side effects but suggests caution for consumers who are pregnant, nursing, taking prescription medication or have an underlying medical condition. Despite this, many reviewers have noted negative effects with this supplement. These are primarily gastrointestinal, including sour stomach, nausea, cramping, bloating and diarrhea. Others have complained of a strong fishy smell, lingering fishy taste and persistent fish burps. 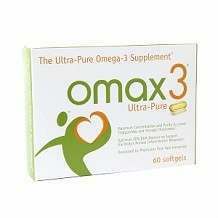 Omax3 Ultra Pure is available from the product website. At the time of writing you could buy a 60-capsule (one-month supply) box for $47.95. You could purchase a 3-box package for $95.90 or a six-box package for $179.94; these two options come with free shipping. The single box was available on Amazon for $42.95. After searching both the package and the manufacturer’s web page we found no evidence of a guarantee. In our opinion, a confident producer will provide a strong guarantee. The market is flooded with Omega-3 products and choosing the best can be daunting. A guarantee eliminates the risk of loss and it makes trying a new product much more attractive. There are things we like about Prevention Pharmaceuticals Omax3 Ultra Pure. They source their oils from fish known to be high in essential fatty acids and the ingredient list is simple with no flavorings, fillers, colorants or preservatives. Some aspects troubled us. Despite no listed side effects, many consumers complained of gastrointestinal distress bad enough to discontinue using the product. Others noted a persistent fishy taste in the mouth and fishy burps. Also the level of DHA may be too low for the supplement to work. Finally, there is no apparent manufacturer guarantee. Bearing all these in mind, we are unable to recommend this product.